HARDtalk's Stephen Sackur talks to Anthony Scaramucci, American hedge fund entrepreneur and a member of the President-elect Donald Trump's transition team. HARDtalk's Stephen Sackur talks to American hedge fund entrepreneur, Anthony Scaramucci. Wherever you live in the world, the election of Donald Trump as America's next President matters. The next leader of the world's most powerful nation promises to take the US, and by extension global politics and economics, in a very different direction. 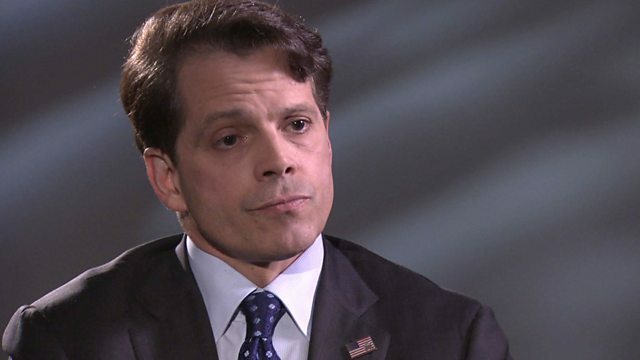 HARDtalk speaks to Anthony Scaramucci - a New York hedge fund boss, a Trump ally, and right now a member of the President-elect's transition team. What are Team Trump's priorities for the United States? Trump inauguration: Elton John to play?